Gastec 10 NO + NO2 (Separate Quantification) SEI Detector Tubes. Detection Range: NO: 2.5-5 ppm and NO2: 5-200 ppm. 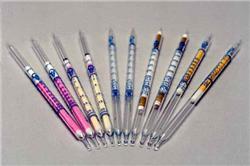 5 - NO; 5 - NO2 measuring tubes per box.